The perfect complement to your home. Designed to enhance the concept of indoor outdoor living while providing a security system without compromising your home’s design. We keep your house safe from intruders with quality security doors, including a wide variety of designs and styles from leading Australian manufacturers. You can be sure that a Keep M Out flyscreen, sliding or hinged door will provide the very best protection. Melbourne's most affordable security door expert. At Keep M Out, we take pride in having the finest and most reliable products available on the market today. Ranging from aluminium to Clearshield Stainless Steel doors, our products also come in a wide range of design options at very reasonable prices. Our unique and customer-focussed service means that we can quote over the phone, and deliver, build and install the door at your home all on the same day. We only use the highest standards in equipment, material and products. 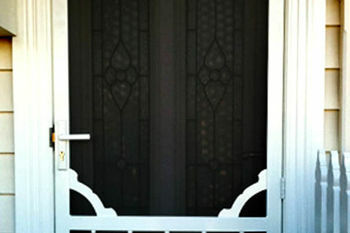 Our doors are made to protect you inside your home. We are passionate about service and we will always come to your door with a smile on our face. In addition to servicing homes throughout Melbourne and Victoria, we also welcome work from builders and commercial needs. We have the supply and capacity to handle work of any nature. Pick up the phone and call us today! We were really impressed with the same-day service that Keep M Out provided.. Excellent work, doors look great. Great company, great job, great bloke! Well done Keep M Out. Keep M Out is Melbourne's most trusted security door installation provider. For over 15 years we have been protecting families from insects and intruders. We provide customised door installation at your home, all on the same day as measurement. 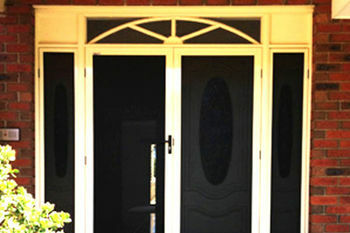 Our doors come in a wide variety of material, styles and designs, all to Australian industry standards.